OK, here's more of my rambly disconnected thoughts, this time about Customer Service Vs Social Media Engagement. I came across this Youtube video (posted 25 Jun 2011), put up by a US health insurer the Blue Cross Blue Shield of Michigan. 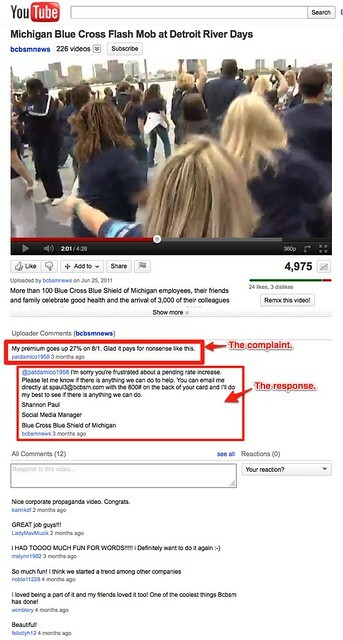 The video showed the Blue Cross Blue Shield of Michigan employees, their friends and family performing a "flash-mob" style dance segment. What caught my eye was this comment posted by an apparent customer: "My premium goes up 27% on﻿ 8/1. Glad it pays for nonsense like this." "I'm sorry you're frustrated about a pending rate increase. Please let﻿ me know if there is anything we can do to help. You can email me directly at spaul3@bcbsm.com with the 800# on the back of your card and I'll do my best to see if there is anything we can do. Blue Cross Blue Shield of Michigan"
Cool. They have a social media manager (perhaps a team?) who knew what he she was doing. Appropriate tone and all that. Was obvious they took ownership of their YouTube channel and took immediate charge of the response (it seemed to be posted at the same time as the comment). Did Blue Cross Blue Shield of Michigan have two separate customer service units? A traditional one and a social media unit? Perhaps more likely that their social media unit was part of the larger customer service unit, or the company corporate communications department. (Maybe they're monitoring the blogs and might post a comment here. Or someone might pass the message along to them). UPDATE: Check this out. A tweet response just minutes after I tweeted! I'm wondering if the new norm might be for two independent customer service units -- at least independent in terms of their specific function, though their overall aim was still about customer management and relations. One unit might handle the "traditional" channels like snail-mail, emails, and telephone calls. More reactive, in the sense that it's the customer who initiates the customer service transaction. Then the Social Media unit would be in charge of trawling for social media mentions. This could be channels set up and managed by the organisation (e.g. an organisation Facebook page), or the broader social media-sphere (e.g. Facebook). Part of the scope might be to also engage in conversations with the customer. Particularly in the case of the latter scenario, where the customer may post a complaint on their own social media space rather than the organisation's. A mix of the reactive and proactive. Extending that idea further, it's less about customer service using social media but more of customer engagement through social media channels. This may allow for easier distinction between a Customer Service department and a Customer Engagement department. BTW, the term "service" makes me think of a production line. i.e. I bring my wonky TV set to be serviced. But as a customer, increasingly I'd expected to be engaged rather than to be serviced like a piece of equipment. If having two channels is the "new normal", then there would inevitably be issue of ROI for the organisation. I suspect at face-value, the traditional customer service unit would be more cost-efficient compared to the dedicated social media unit. Afterall, the traditional customer service unit is structured to be efficient. Basically, the customer service staff are like the production line, handling calls as they come in. Customers tend to be the ones waiting to be served. The social media unit has to be accessed slightly differently. When we're talking about "engagement", I think we're talking about measuring in terms of customer satisfaction -- or the quality -- rather than efficiency of a customer encounter. You can be efficient with the customer, but it doesn't necessarily mean the customer is more satisfied with what has taken place. I think "engagement" is really about "reputation" and "goodwill". If the organisation has a way to measure the worth of its reputation and goodwill (which you can, in accounting terms), then I think that's a way to measure social media engagement. What's harder to measure is linking the ultimate outcome -- which is sales or the customer's repeated use of the service -- to the amount of staff time expended. But that's the whole point about a social media engagement unit: you can't expect a causal relationship from engagement to 'sales'. That's seems more like a sales department function, in my view. Well, you can chart trends or try and derive correlations. But that's the other point: Mapping out trends means we need to take a longer time. Can't expect instant wins where social media engagement is concerned. p.s. Feel free to comment/ agree/ disagree. I'd appreciate any insights to help refine my thoughts on this matter. My blogging frequency has decreased sharply since the beginning of this year. A big reason was that work had eaten into my personal time. First three months was just crazy. We hope to build on the existing network of reading communities to nurture a vibrant reading culture and cultivate an understanding and appreciation of the literary arts. While the National Library Board (NLB) manages about 100 reading communities (which organise monthly book discussions), only a small number of such communities integrate all three elements of reading, writing and storytelling. Writing, and the appreciation of local writing, is still a very niche activity that has yet to take root. Singaporeans could be encouraged to come forward and contribute their personal stories (e.g. with old photos, letters) through communities for reading, writing and storytelling. These communities could be set up all over Singapore, in libraries, community clubs and even the places where we work and live. 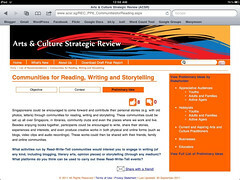 Besides enjoying books together, participants could be encouraged to write, share their stories, experiences and interests, and even produce creative works in both physical and online forms (such as blogs, video clips and audio recordings). These works could then be shared with their friends, family and online communities. 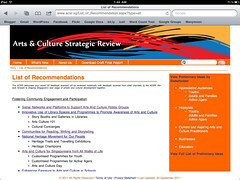 The entire ACSR plans (still a draft as of this post, at the post-public consultation stage) has several components, and will be a mutli-MICA-agency effort. The National Library Board is one of those MICA agencies. The ACSR was initiated by the Ministry of Information, Communications and the Arts (MICA) in 2010 and aims to chart Singapore’s next phase of cultural development until 2025. This review would also aim for twice as many Singaporeans – from 40% to 80% – to attend and benefit from at least one arts and culture event a year by 2025, and to encourage Singaporeans’ active engagement in arts and culture activities, up from the current 20% to 50% by 2025. This could include taking up or volunteering for arts and heritage activities in their personal time. 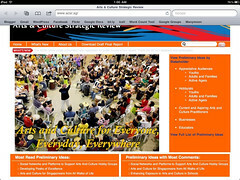 You can download the 50-page draft report here, at www.acsr.sg/download.aspx (public consultation just ended recently). Or you can scan through the summary list if recommendations, here. There will be some other changes to my work scope. It's not a state-secret but I'll share more when it's finalised in a few weeks' time.